I found Deidre, my Viridiflora tulips. 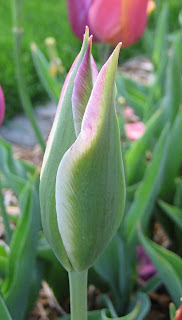 I posted about them a few weeks ago because I could not remember where I planted these green tulips. This morning I found them. I remember now what I did. When I planted the tulips last fall, I opened all the packages of bulbs and mixed them together and then planted every single one in the new flower bed I made around the lamp post. I think that was a mistake for Deidre. She is having a tough time competing with the other tulips. I should have planted these green tulips in their own group someplace where they could be viewed together and not have to compete with all the other tulips. See how they are in the group? Not too showy. Deidre just does not stand out like this tulip below. And since this tulip has no name that I know of, I'm naming it "Spring Sunset". Once these all the tulips finish blooming, I plan to pull them out of this bed and either compost them, or replant them someplace in the back yard and see if they come back next year. Anyone have any good success moving tulips like that? The green tulips are definitely lost in all of the green foliage. 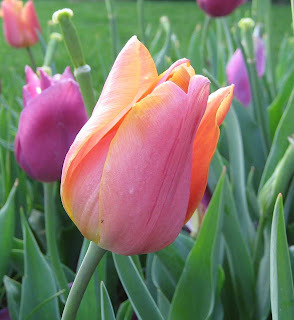 Spring sunset is such a beautiful tulip, and such a fitting name. My neighbor just pulled her tulips up and replanted them. It would be a shame not to at least try to replant them and then if they flop you can compost them later. 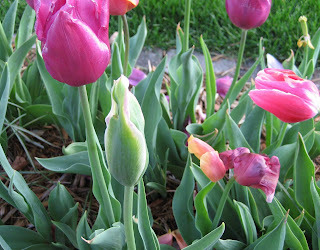 I've replanted tulips many times with 100% success! 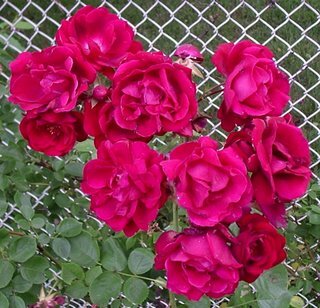 Just remember to plant them deeply enough (6-8") and fertilize them, and they'll come back for you. My 'Deirdre' are not opening just yet, but this weekend, I expect the warm weather we're predicted to have will bring them out. I have them planted with 'Chinatown' which is similar, but with a bit of pale pink. In Dallas, I treat tulips as annuals, or I have to dig the bulbs up and replant. Thus, I don't do tulips. I have to say that your Spring sunset is so beautiful, I almost want to try! I think I'll just visit your blog when I want to look at them! Go right ahead and replant your tulips wherever you want. They are extremely tough. Two years ago, I dug up a bunch of bulbs, put them in a paper bag on top of my fridge and forgot about them all summer. In the fall, I remembered them, planted them in their new home and they have come up and bloomed each spring since.